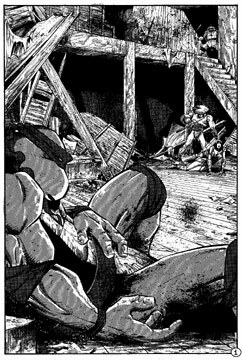 As the Elite Guard prepares to deliver the killing blow to Karai, Donatello manages to overcome his injuries and grab one of the Foot Soldier's machine guns. Before the Elite can act, the Turtle pulls the trigger and kills him. Karai arises and goes over to Don, helping him stand with his broken leg. April arrives at Mrs. Jones' apartment building. It seems that April has decided to invest the money she got from her father's estate into rental property, and coincidentally, Mrs. Jones is looking to sell her apartment building and retire in Florida. Mrs. Jones takes April on a tour of the place, first stop: the basement, where the "handy man" is working. Mrs. Jones asks April if she'll keep the handyman on, and O'Neil is tentative. 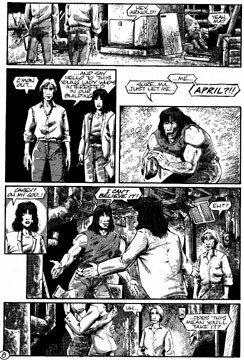 Soon enough, Arnold Casey Jones is "introduced" to April. Casey and April both exclaim "I can't believe it!" and give each other a big hug. "Uh... does this mean you'll take it?" Casey's mom asks. Leonardo is facing off with the final Elite in a sword battle. Both are cut seriously when Leonardo drops his katanas and lunges into his adversary. 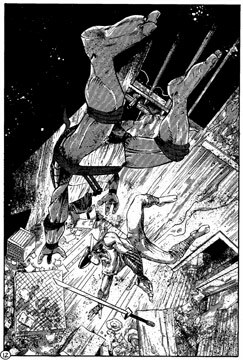 The leap takes both of them over the edge of the collapsed floor and they fall to the first floor - neither the worse for wear, the hand to hand fight begins. After initially getting the upper hand, the Elite is overpowered by the Turtle and dispatched. The old man in the hospital, Mr. Buscheyev, is checking out, although he still looks depressed. Leonardo makes a splint for Don's broken leg while Mikey gets to work constructing a travois. Karai thanks the Turtles for their help. "I... I owe you a great deal." she begins. "You owe us nothing but your word, Karai." Leonardo tells her. "We made a deal," Don notes, "Just honor your part of it." "I will keep my word, Turtles. No longer will the Foot Clan bother you. We have our world... and you will have yours." 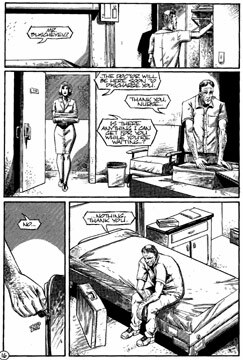 "I'm just glad it's over... maybe now we can live a normal life..." Mike hopes. "But... what of the price of this... peace," muses Don, "The blood shed, the lives lost..."
"I'll not say I'm pleased with the way it happened, Don... but can't you see? Finally... for the first time in our lives... we are not in the shadow of the Shredder." Leonardo explains. "What about you, Karai?" Mike queries, "What will you do?" "Once the reorganization of the Foot in New York is completed, I will return to Japan. There... I will spread the ashes of my daughter on Asana Bay and perhaps... begin the healing of my ravaged heart." Karai states. "But even my grief cannot intrude on my duties. The company's -- the Clan's -- interests supersede all else. It does me no good to wish it otherwise." Karai says. "Can't you change things?" asks Mike. "Perhaps... someday," Karai answers, "But for now, it is my path... as your path, until today, has been one of vengeance and reprisal, this path has ended, as life has offered you a new beginning... use this opportunity well." "We will Karai," Leo states, "We will." Battle rages on. Going home. 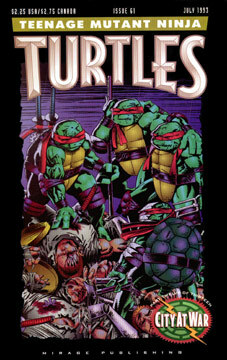 TEENAGE MUTANT NINJA TURTLES and all related titles, logos and characters are copyrights and trademarks of Viacom International Inc. All rights reserved.